There is a lot of demand for Excel users who can create Dashboard reports, and I have received many emails from people all over the world who say they want to learn more about creating Dashboards in Excel. In my recent article on creating dropdowns for dashboards, I showed some simple techniques for creating interactive charts using dropdown menus in Excel. This just touches the surface of what is possible. You probably know that to create awesome Excel Dashboard reports requires a thorough knowledge of many Excel techniques, but also principles of good visual design, and learning this practical knowledge takes a significant investment of time. If you have been looking for a course to teach you how to create your very own Excel Dashboards, then you should check out my review of the excellent online Dashboard course created by Mynda Treacy at MyOnlineTrainingHub.com. Mynda from MyOnlineTrainingHub.com has created a comprehensive Excel Dashboard course that contains over 4 hours of clear video instruction, covering dashboard design principles, charting techniques, interactive Excel form controls, data analysis and publishing. Watch my video review below (via YouTube) and read the transcript following, which shows various screenshots from the Dashboard course. And when you want to check out the course sign-up page, I provide a link at the end of the article. 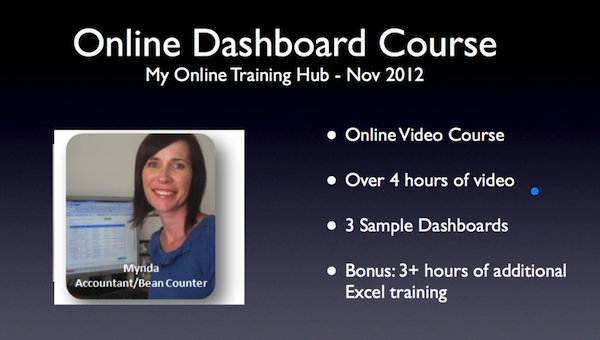 Watch my 20 minute video looking at why you should learn how to create Dashboards, and evaluating the suitability of the online training course provided by MyOnlineTrainingHub.com. You can check out the actual course sign-up page by clicking on this link but come back for my full review to see whether this is the right course for you. Click on the video below to watch my review. Please feel free to ask me any questions about the Dashboard course, especially on topics that I didn’t cover in the video. I can thoroughly recommend this course but before you feel comfortable making a purchase you may want to have more information, which I’m happy to provide. Note: The video was transcribed by SpeechPad and then further edited into the form you see below. Hello. This is Victor, from Launch Excel. Today I am going to take you through a quick review of a new online training course about Dashboards that has been created by MyOnlineTrainingHub.com. If you enjoy the review and you find it helpful, just check out the link to find out more, at the end of the video transcript. The first question to ask is, what are Excel Dashboards, and why would you want to learn about them? With an Excel Dashboard, you can create a very eye-catching report, just like this one. 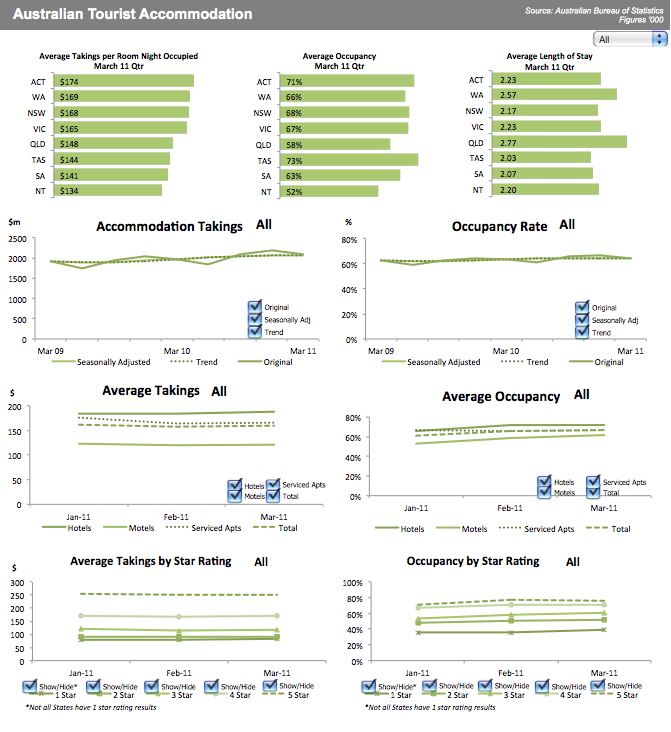 You will see, at a glance, the key stats for, in this case, Australian Tourist Accommodation. Not only can you create eye-catching reports, but these are interactive, and you can see here there is a drop-down menu, which you can use to select different parts of the information to display or hide. 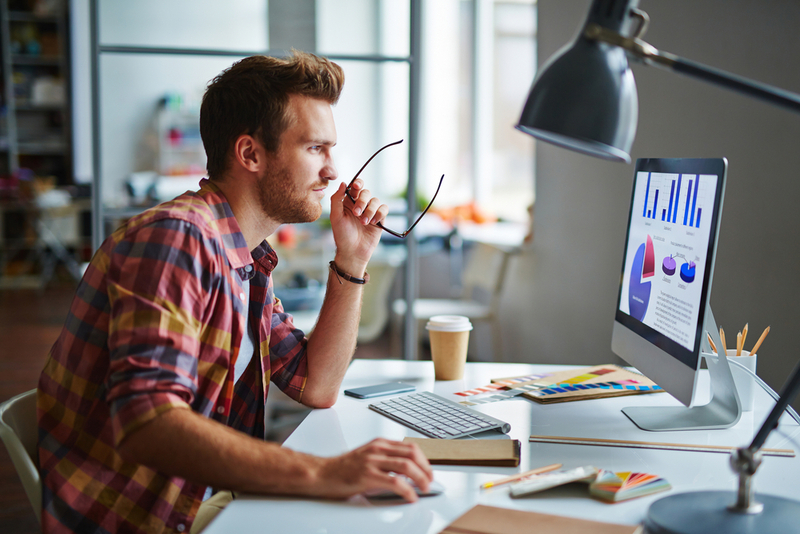 These reports are eye-catching, but they are also useful, and the skills for creating Dashboards in Excel are in high demand. I just had a quick look on LinkedIn today, which is the 5th of November, 2012, I checked out the Dashboard Skills in Excel, on LinkedIn, and because LinkedIn’s such a big, professional networking site, the figures that you see on LinkedIn for skills are a good indicator of what people are looking for and what people are reporting. What I saw was a 15% year-on-year growth in the reported skill of Excel Dashboards. More and more people are trying to learn Dashboards, and show that they can use dashboards. They are not that widespread yet, so Dashboard skills are still very desirable, because not many people have them. Once you gain them, you will stand out, especially if you are looking for a new job, or perhaps to expand your existing role, or maybe just to wow your boss. These reports are also known as Performance Dashboards, KPI Dashboards, and Dashboard Metrics, you might hear these terms being used. If you are a data analyst, financial analyst, or a business analyst of some sort, then Excel Dashboards are a great way to combine data analysis and data reporting into one clean page. Here is another Dashboard. This shows Australian overseas arrivals and departures figures for 2008, 2009, and 2010. This is a second Dashboard that has been taken from the course, and is part of this online course, which I will talk through later. You will get to see how this was constructed, and see how the techniques were put together to create this one very nice Dashboard report. The first thing to note is that it fits on the screen. It is a one-page report that gives a great overview of the stats. You can read it from top to bottom, left to right, and you can also see interrelationships, such as that between the different years. It gives you a very easy way to compare 2008 figures to 2009, 2009 to 2010. The second thing that is great about this, is that it makes a good use of charts to visually present the data. Data in tables is useful if you want to see precise figures, but data in charts gives you a much better way of visualizing trends. You can see the trend here is upwards from 2008 to 2009, and even more upwards from 2009 to 2010. Mixing charts together with data and tables allows you to see trends, as well as to see the actual figures. This third and fourth element I would like to highlight is a slider. This slider, you would see, can be moved left and right, and as part of the course, you will see how Excel has certain form controls that you can embed onto the spreadsheet. 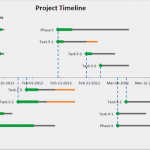 Your worksheet will have this form control that slides left and right, and you can then link that to this chart, and then show different figures, depending on whether you want to show November 2010 or December 2010, or you want to go back to a different month. The chart automatically updates as you slide the slider left or right, and it is the same with this one. These are independent sliders that you can choose to slide into different dates, and you can set this up however you want it. The final thing I would like to highlight is the checkmark. Here is another nice little visual indicator, just next to these in-cell charts, a nice little visual indicator, just to show whether something has increased, decreased, or what changes happened to it. 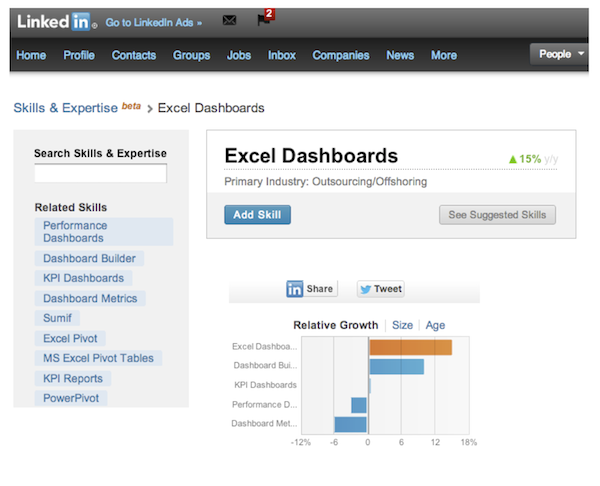 Overall combined, those features make Dashboards a very powerful reporting tool. You can see trends quickly, relationships between data, and you can actually see the numbers presented, in detail. It highlights exactly the things you want to show, and it does not confuse the reader. A well-defined, well-designed Dashboard does not confuse the reader. There are a lot of things on here, but they are all useful, and this is one of the things that is great about Dashboard reports. Let us go on to the online Dashboard course. This created by My Online Training Hub. The teacher of the course is called Mynda, and she has been creating this to help integrate knowledge of data analysis, charting, pivot tables, and macros, all into one nice integrated course. It is an online video course, what that means is you will have access to over 4 hours of video just on Dashboard: Principles, techniques, tips and tricks, and you will get 3 sample Dashboards. The videos and Dashboards, if you choose the view-only option, then you will only get to view the videos, but there is a download option, in which case you can actually download the videos for viewing. These sample Dashboards can be downloaded any time, and they are yours to keep. In addition to the 4 hours of Dashboard videos, there is an additional 3 hours of Excel training. 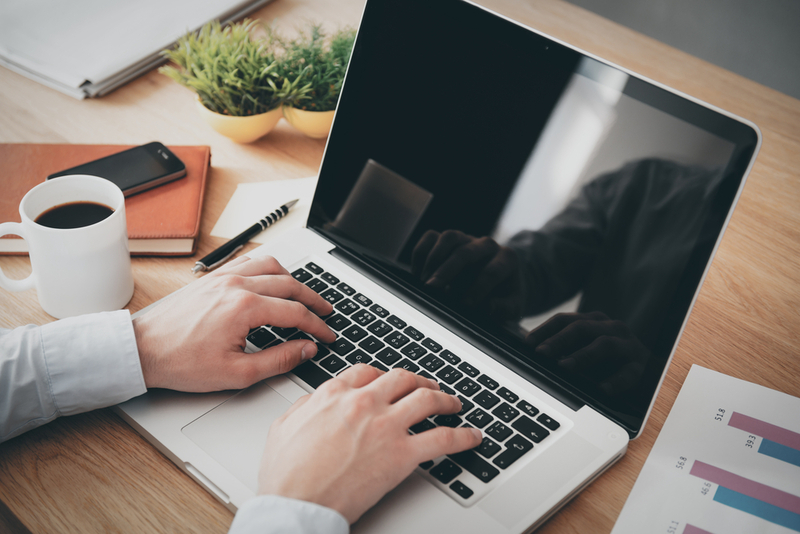 Sometimes, you may find that the Dashboard material, the techniques used, are a bit foreign to you, so you may think, ‘How do I go about using pivot tables, or look-up formulas?’ There are quite a few bonus hours of additional Excel training that are linked within the course. If you come across something that you are not sure of, there is often a bit of additional Excel training, either to help remind you of how to do something, or to show you, from the start, how to do something in Excel. You get 24-hour access to the videos, and it is a 12-month membership course, so you get a whole 12 months, once you pay the upfront fee. You get a lot of personal support from the teacher, and Mynda is very responsive. I have seen her reply, mostly on the same day, or the next day, if you post a question to her, either by commenting, or by emailing her, you will get a response very quickly. Let us go quickly through the course design. I am sure you are interested to know what exactly is in the course. It is video-based, which is great if you want to watch the techniques being demonstrated in Excel. It is very fast-paced, because Mynda wastes no time going through: She just goes straight to the principles, shows the techniques, shows how they work, and puts them into practice. You can find it here, if you go through this link: www.LaunchExcel.com/ExcelUser-ebook. 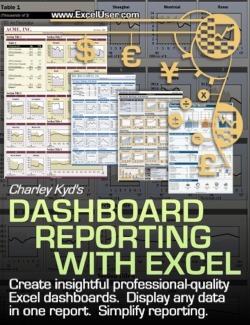 Charley Kyd’s eBook comes with about 200 pages of very useful principles, techniques, and tips and tricks on how to create Dashboard reporting with Excel. It is definitely worth checking that out, too. As for the actual course contents, the first couple of chapters in the course talk about design and display principles: How do you effectively display data? How do you prepare it in order to present it? They are very useful sessions to have. You can obviously skip those sessions, but they are very useful to go through, there is maybe half an hour’s worth of principles. Then it goes on to explaining form controls, and how you use those to interact with the spreadsheet. You saw the slider, which you could use to go left and right. There is sometimes, drop-down menus, you can use to expand options and allow the user to choose different options. 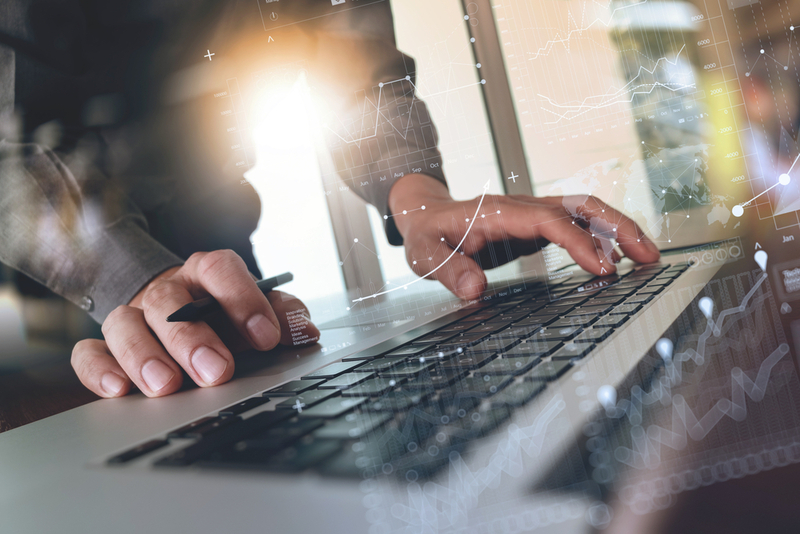 Once you know how to use form controls, Mynda will show you how to use them in an interactive spreadsheet, and use them to drive charts, so that when you change something on a form control, it is linked to the chart and the chart will update. 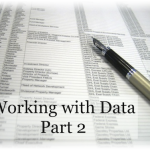 The third thing that Mynda goes through is actual data analysis functions, such as look-up functions, and also how to use pivot tables. After that, there is a little bit of simple automation with macros, as well as how to use a Microsoft Access database to extract data from, and display that in the Dashboard. The final sessions talk about distributing the Dashboard, and this is where you may want to think about security and protection. Mynda goes through a few of those key topics, too. What about the sample files? You get a homework assignment. After you have gone through the videos, and you have mastered said techniques, you get to have one practice challenge at the end of the course. The task in the practice challenge is to create a Dashboard to show leads and sales performance. You have a set of dummy data, and some instructions asking you to, say, name the top sales people, etc. The dummy data has more than 2,000 rows of leads data and 2000 rows of sales data. At the moment, I cannot find any examples provided of a completed Dashboard, but if you are stuck on this challenge, Mynda will be more than happy to help you. I know she is very responsive, as I said before, and if you ask her a question or if you want some help creating this Dashboard with the homework challenge, just let her know, and I am sure she will be willing to help. There are other download files too. 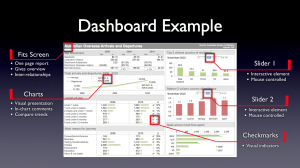 As I mentioned before, there were some PowerPoint presentations of certain sessions, and these summarize, for example, the key principles of how you display a Dashboard. 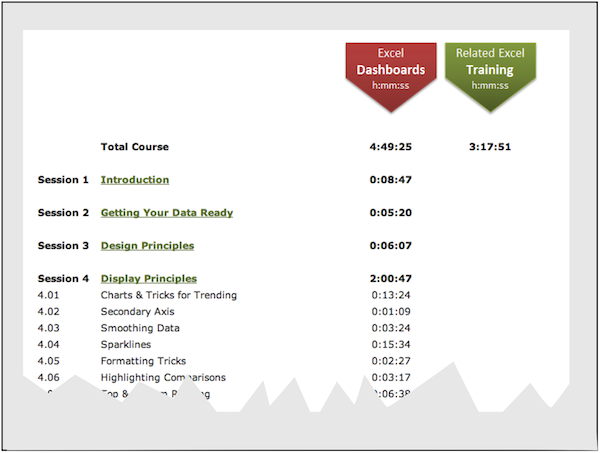 You get to download 3 complete sample Dashboards, which demonstrate the principles in action. 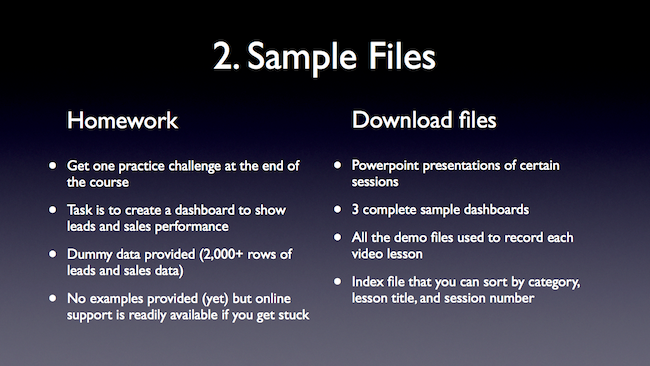 You also get the demo files used to record each of the video lessons: Each of the individual tips, techniques, and principles lessons. You will see the demo files used to demonstrate, for example, form controls or pivot tables. Finally, this is the one I like quite a lot, you get an index worksheet file that you can sort by category; you can sort it by lesson title and session number. If you can remember something, say, 2 or 3 months into the course. You remember looking at form controls, but you cannot remember what lesson you saw them in, you just open up the index file, and then do a sort-by-lesson title, and look for the right lesson, and that will show you which session to look in. The index worksheet is a very useful way to go back to review material, but it is also a useful way to go forward. For example, if you are familiar with most of the lesson, you can skip lessons and go to the sessions that you prefer to learn about. This index is a very useful thing. All these are available as download files; you can keep all of these for future reference. You have 12 months of access to the videos, but the download files you can keep forever. Of course, there is a separate video download option, in which case you can download the actual videos to keep too. Talking about videos, I thought I would talk about course access. You get 24/7 internet access. What this means is you need quite a fast connection to stream the video lessons. They are hosted on a private server. You would not have any trouble with corporate firewalls blocking access to YouTube. I know some of you have told me that your company blocks access to YouTube, which means you cannot watch my videos on YouTube at work, but should have no problem accessing this dashboard course, even if your corporate firewall blocks sites like YouTube. 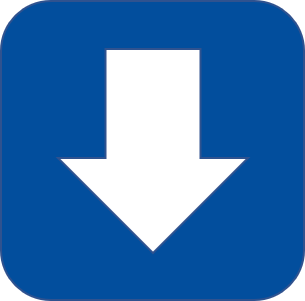 As I said before, there is a download option which is available at an extra cost. What this does is it allows you to download all the Dashboard videos, so you can see them in your own time, without internet access. But you do need to wait 30 days before the video downloads are enabled (30 days is the length of the refund period). 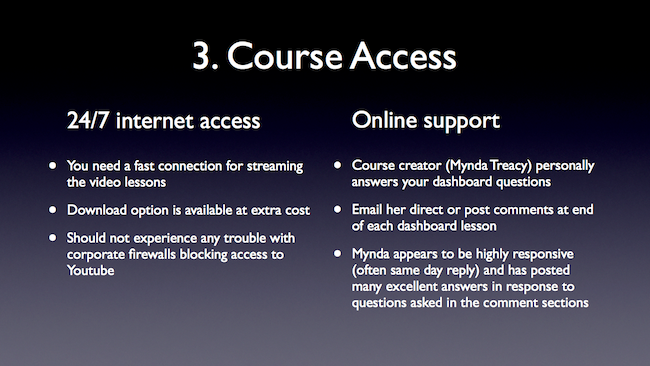 The online support is worth mentioning, because the course creator, Mynda Treacy, personally answers your Dashboard questions. If you email her directly, or if you post comments, at the end of every Dashboard section, there is a comment section, she is very responsive, and I have often seen her reply on the same day or perhaps the next day. 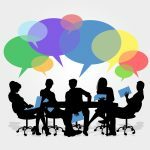 Mynda has gone through and posted many excellent answers and responses to questions asked in the comment sections. Once you get on the course, and you watch the videos, feel free to ask her any questions and she will be more than happy to help. 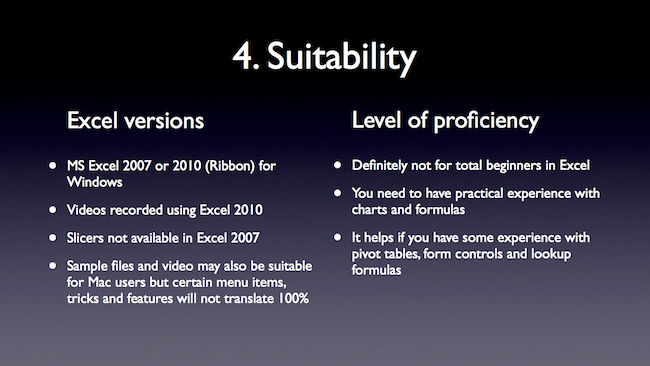 Finally, a little word about suitability: Who is this course designed for? In terms of Excel versions, the course is recorded using Excel 2010, so the videos show the Excel 2010 menu system, but most of the course is suitable for either Excel 2007 or 2010. The one thing to note is that a feature called Slicers is not available in Excel 2007, so they are an Excel 2010 feature, and there are possibly another handful of features that are available just in Excel 2010. The sample files and video may also be suitable for Mac users, but certain menu items, tips and tricks, and features will not translate 100% to the Mac platform, so just bear that in mind. As for the level of proficiency, this is definitely not a course for total beginners. 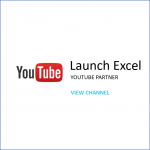 If you have used Excel for a couple of weeks, then you will struggle with this course. If you have used it for a couple of months, you will probably also have quite a hard time, unless you have gone through some other spreadsheet software before. I recommend that you have a year or two of experience with Excel: You should know how to use charts and formulas, create new charts, modify existing charts, how to use simple lookup formulas and some simple data-analysis formulas, sums, counts, and averages, if you have got experience with those features, then you should be able to take this course with no problem. It also helps if you have experience with pivot tables, form controls, and some detail lookup formulas. If you have experience with those, it would make the course even easier. What the course does is show you how to integrate all these different features into one nice Dashboard report, and how to bring them all together to work nicely. I recommend you do not take this course if you are a beginner, but if you are an intermediate user who knows about charts, formulas, maybe has done some pivot tables; maybe a little bit of macros and form controls, then you will have no problem taking this course. Let us listen to some comments from what other people say. I have taken these testimonials from My Online Training Hub, and this is feedback provided by actual users, people who have downloaded the course or viewed the course. I hope you have found this review helpful. If there are any further questions that you would like to ask, just leave a comment below, and I would be happy to answer. 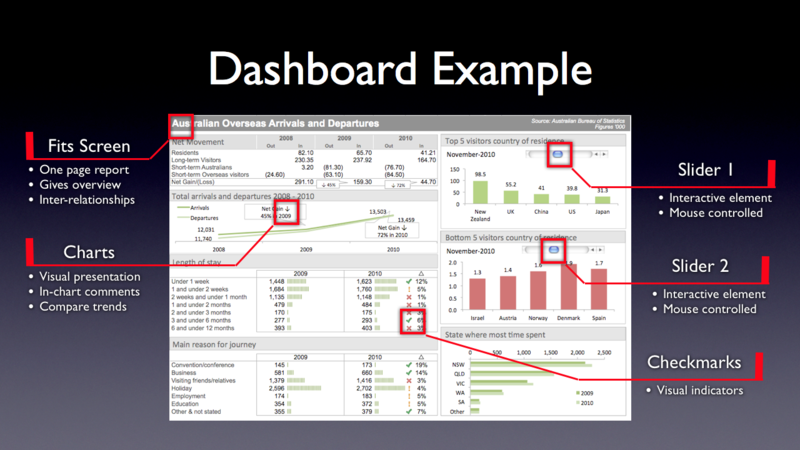 Remember to check out the Dashboard course today if you want to learn how to create your own awesome Excel Dashboards. You can do this at www.launchexcel.com/myhub-dashboard (this link takes you to the third party site “MyOnlineTrainingHub.com” created and hosted by Mynda and Philip Treacy). P.S. As of 23-Apr-2013 the course has reopened with a special Early Bird Discount of 20%. Wednesday 8th May 8pm registration closes. All times and dates are Pacific Time. 20% off until 8pm 1st May. To register for the course and use the 20% coupon, click here. I know this web page gives quality based articles or reviews and other stuff – thanks for doing this.